Selecting the perfect present can be difficult. Not sure what to choose? 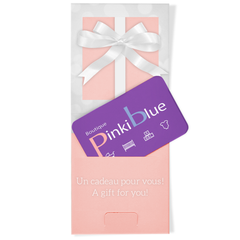 Give the gift of Choice with a PinkiBlue Gift Card. Gift cards can be purchased online and picked up in-store by you or the recipient. You can enter a custom note before you checkout. Once your purchase has been processed, we will contact the recipient and let them know that you purchased them a gift card.